Photo by Japan for Sustainability. It is not all that long ago when we began using so many electrical appliances in everyday life. Japan’s first “pulsator-type” washing machine, a prototype of current models, reached the market in 1953. Its popularity exploded as it was a convenient product that considerably reduced household work loads. Full-scale television broadcasting also started in 1953. This year set a precedent for the expanding use of various home appliances; so much so that it was later referred to as “year one of electrification”. Among these new appliances, the washing machine, refrigerator and black-and-white television set were called the “three sacred treasures” (referring to the Imperial regalia of Japan, the sword, mirror and jewel) that everyone longed for at that time. With incomes increasing as a result of rapid economic growth, consumer demand for these home appliances skyrocketed. By 1973 most households had purchased these 3 appliances. Japan’s electricity use steadily increased starting around this time. Even after the “oil shock” of 1973, electricity use increased about 2.5 fold during the 35 years to 2008. The most substantial increases occurred in the consumer/household and transportation sectors. The increase in household use was partly due to changes in social structure, such as an increasing number of households, and also by changes in private lifestyles demanding more and more convenience and comfort. This was a time of “individual electrification” when each individual, rather than each household, came to own a set of electrical appliances. Despite these social trends, Yasuyuki Fujimura, a doctor of engineering and an inventor, has been advocating a “non-electric” lifestyle that intentionally avoids the use of electricity. The phrase “non-electric” may sound a little unfamiliar, but it is different from “anti-electrification” that condemns electricity on principle. The phrase is meant to communicate the idea that it should be possible to live happily and richly while enjoying a moderate level of comfort and convenience without depending on electricity. Fujimura has a Ph.D. in physics and originally got a job at a major equipment manufacturer. He was an elite engineer involved in the development of advanced technologies including plasma processing machines, cogeneration systems and gas heat pumps. His turning point was when his newborn son was diagnosed with allergic asthma. As he found out, at that time, in the 1980s, there was a surprising increase in the number of children with allergies. As he continued his research, he learned about environmental problems. He realized that the environment was deteriorating and harming the health of children as one of the down sides of rapid economic growth fuelled by the vigorous promotion of scientific and technological advancement and the pursuit of more and more convenience and comfort. To create a new lifestyle, Fujimura started to work on the theme of “non-electric” in 2000. In 2003, he established the Atelier Non-Electric and continues to develop many non-electric products. 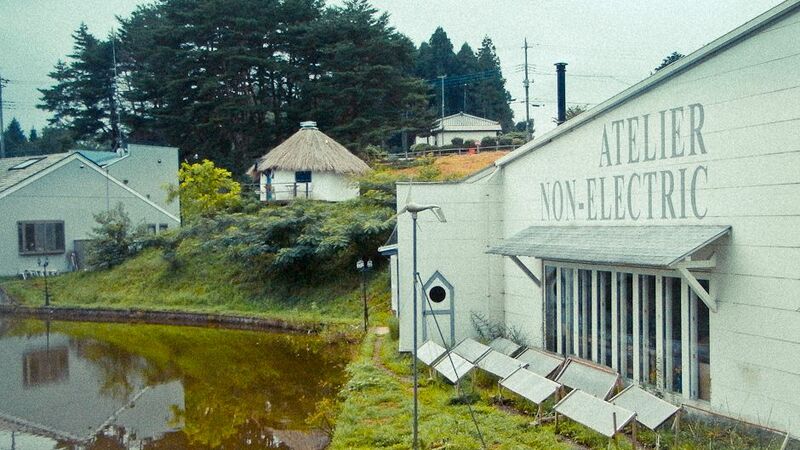 Atelier Non-Electric is currently located at the foot of the Nasu Highlands, one of Japan’s major resort areas in northern Tochigi Prefecture. Transportation is convenient — Nasu is about 150 kilometers north of Tokyo and can be reached in 90 minutes by the Tohoku Bullet Train. The approximately 1-hectare site is a kind of exhibition space that presents a “totally non-electric life.” A non-electric house utilizes chaff, whose heat insulation performance is as good as glass wool, to the maximum. A non-electric composting toilet uses the power of microorganisms, which can decompose human waste into manure without an electric pump. The non-electric bath house uses a variety of energies such as solar power, firewood, or even garbage. These non-electric facilities are located around a pond. Radiational cooling occurs when infrared radiation is emitted from an object’s surface, causing its temperature to decrease. On a clear night, infrared rays are emitted from the ground into the atmosphere, cooling the air down. This is why the night is extremely cold in the desert. Most people have experienced water’s natural convection currents when warm water rises while cold water sinks and pools at the lowest level. Another popular Atelier product is a handy non-electric coffee roaster. The roaster is made of aluminium and shaped like a saucepan with a handle. Raw green coffee beans are put into the pan and roasted on a gas stove for three to five minutes by shaking the pan right and left. The beans are roasted evenly and as lightly or deeply as the consumer prefers. The process of roasting raw coffee beans, cooling them down, grinding them in a coffee mill and pouring fresh brewed coffee into a cup takes about 25 minutes. Not many people want to take such a lot of time to make a cup of coffee in today’s society, which requires speed everywhere and at all times. Fujimura did not actually expect much when he started to market the roaster. This product, however, has sold some 8,500 units so far since it hit the market six years ago, even though it has not been widely advertised, except on the website of Atelier Non-Electric. Although it is a very simple tool, it took six months to develop the roaster. Coffee beans need to be roasted evenly. The material used needs good thermal conductivity so that it will not take too long to roast beans. Also, the shape had to be designed so that the raw coffee beans roll around easily in the container. Furthermore, the sound of the rolling beans needs to be pretty and pleasant. “To make a good non-electric roaster, I needed to use my ingenuity. Thus it took me half a year,” Fujimura laughs. “Actually, it takes more time to develop low-tech than it does to develop high-tech although we tend to think of advanced scientific technology when we say ‘technology,’ while we take low-tech lightly,” says Fujimura. On this misplaced assumption, we tend to desire the products of excessively advanced science and technology that promote convenience and comfort, and thus we have placed a huge burden on the environment, leading to the energy crisis and other critical situations. Fujimura’s dream is to make the Non-Electric Atelier a theme park that showcases the many options we have for fun, affluence, and happiness, particularly in the area of housing. He wants to show that non-electric houses — even when they are built by non-professionals — are lovely yet strong, good for the health while consuming little or no energy, and furthermore can be built practically for free. He would like to make the atelier a kind of housing exhibit, and believes it will encourage people in the younger generation who feel they can’t afford to own a home. This article appears courtesy of Japan for Sustainability. Life Without Electricity by Kazuko Kojima is licensed under a Creative Commons Attribution-NonCommercial-ShareAlike 3.0 Unported License. Kazuko Kojima is coordinator of “Miracle Miracle” project at Japan for Sustainability (JFS). After working for a publishing company as an editor of books on cross-cultural understanding, and for the Global Environment Information Centre to promote collaboration among businesses, governments and NGOs, she joined JFS in 2006 to launch the Daiwa-JFS Sustainability College, a four year program of monthly lectures for university students on sustainability issues. In 2010 she attended the launching of “Miracle Miracle — A Place for Global Kids to Create the Future” (http://miracle-kids.net/en/), a bilingual online community website to connect children around the world and is currently involved as project coordinator. the heat radiation from the air into space cools the air. it would be interesting/economical to combine collecting heat in the day time and ‘cold’ at night using the same rooftop panels. in the daytime they need to be insulated, at night they should be ventilated to loose the heat of the fridge. Bravo to Fujimura for his pioneering work, and to OW2.0 for running this inspired piece. Dr Joe Okeke commend the invention and wish to be a part of collaboration for transfer of the technology to the entire Rural Women worldwide,Africans in particular. Has there been an update on this project?